The grammy nominations are out today and so begins the season of comparing one artist to another, comparing one person’s creativity to someone else’s. What does that even mean? How do you begin to compare two things that are meant to be different? How do you determine that one is better than the other? If I get up everyday and work on an idea, take baby steps every time improving my craft, and someday enjoy some modicum of success because people recognize my efforts, acknowledge my accomplishments and reward me for sticking with it, why, then, do I have to be compared with you when really, you’re just doing the same? What’s the real message behind award shows? In Big Magic, Gilbert talks about the creative process, why it’s an organic thing, something you do to express a talent, a gift, a fire that’s burning inside you. For many such creators, there is no reward except an intrinsic one – the knowledge that you accepted the mantle, that you honored the gift, that you did something with an idea that’s been nagging at you for years. Creativity is its own reward. It’s an extremely personal thing to write or draw or sing or paint or make a movie, to create in whatever form, something that comes from deep inside you, and put it out there for everyone to see, to listen, to experience, to share, to identify, to critique, to comment, to criticize. Artists and artistes should be celebrated just for being brave enough to share their work. Instead, we find fault, we rip apart and then when they don’t run away from our discouragement fast enough, we pit the survivors against each other so they can destroy each other while we watch. For the few who survive, the unlikely victors in each round of our society’s Hunger Games, these last brave souls now have to prove that if present them is good enough, future version of themselves will be even better – and not in their eyes but ours. A few years ago, Adele introduced herself to us with a couple of great albums – Adele 19 and Adele 21. She took some time off to start a family and came back, with bells ringing, with Adele 25. Her aptly named song, Hello, is breaking records everywhere. But do you know the number question everyone asks her? What will you do to top this next time? What! The very idea that you have to top your own success. Yes, okay, get better. But get better for yourself. Not because you want to achieve someone else’s definition of success. This kind of thinking can be crippling and it’s difficult to create surrounded with that kind of pressure. It’s why To Kill a Mockingbird was Harper Lee’s only published work for over fifty years. The verdict is still out on whether she wanted the prequel Go Tell A Watchman to be published since she kept insisting that she didn’t want anything else she wrote to be compared (unfavorably) to Mockingbird. Ms. Lee didn’t want to tarnish her legend. She didn’t want to disappoint the people who would be fans if her second book was awesome, and would be naysaying critics if it wasn’t. Way to quench a creative fire, critics. Way to go! It’s a very hard thing to create. It’s hard to get up very morning and go punch a clock at a nine-to-five job that you hate. But at the end of the day, the world doesn’t know the highs and lows of your day. If you failed at a work project today, you get to lick your wounds in private and go back and do it better tomorrow, if you choose, on your own terms. A person who works in the creative arts, whatever their field of expertise, has to delve into the realm of their experiences and produce something magical every single time or be lambasted for it. Nobody can handle that kind of fickle support for too long. Let’s be a little more understanding and supportive to the artists and creators who entertain us, who immortalize our feelings in song or dance or stories or movies. Let’s celebrate with them instead of criticizing them. Buy their art if you can and focus on enjoying what you can instead of identifying what’s wrong. Can we just be kinder, period? Can we stop comparing people (and things) who never wanted to be and were never intended to be the same as anyone (or anything) else to begin with? Great thoughts! Thanks for sharing. It provoked me to think about what success means to me. Success for me would be being able to get up every morning and do what I love. I personally don’t think I would be offended or pressured to do what my fans expect from me…and maybe I am only speaking out of my own ignorance…I’m not a famous artist who has had to deal with that pressure, but for me success would be getting up every morning and being me! I’m on my way, but for now I have to keep a day job that drains me so I can support myself and my family, and maybe that’s not a bad thing…I am currently creating from a place of abundance, I don’t have to rely on what people think of me to survive…I can create unhindered by the outside forces…I wonder if I was a full time artist, how much influence the people supporting me life by buying my art would have…As much as I give them I suppose…What if I refused to create for others, and continued to create what was inside of me for the love of it…like I said you have given me lots to think about…thanks for the great post! And thank you so much for your comment, Josee. If you can, read the book, Big Magic. Gilbert talks a lot about doing just what you’ve said – creating from a place of abundance and creating just for the sake of honoring your gift, even if it doesn’t now or never does support you financially. All the best with your creative pursuits. I’ll check out your blog to keep up with you. What an interesting book. Will have to note to read it. I struggle every day with my grammar and I hope one day it becomes a distant past. The bridge between struggle and change is hard work, Kreyola. Find that thing that you can do every day to change your situation and work on it consistently. Every single day. You can do it! That’s advice for all of us too. There’s something we all want to do better. Persistence pays off. Love this, Karen. You’re so right about creation being its own reward. 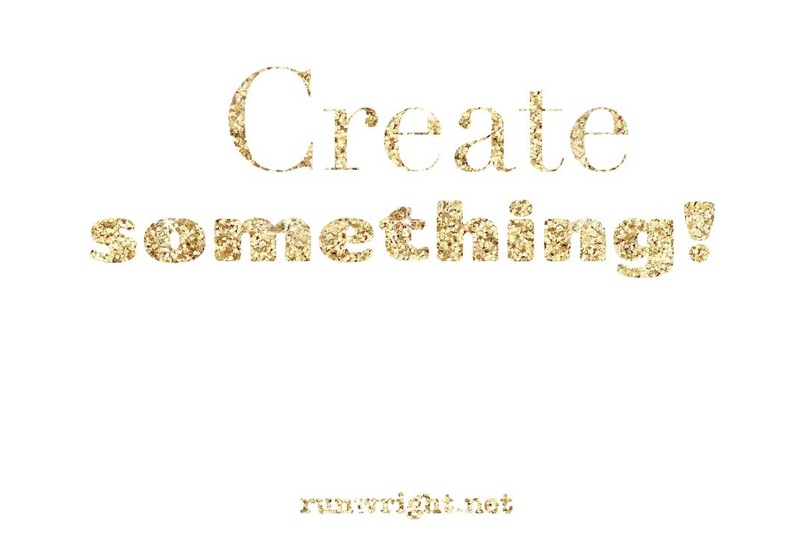 I find that when I create, it’s helping me be enthusiastic about ALL areas of my life. Why? Because I’m more joyful. Period.